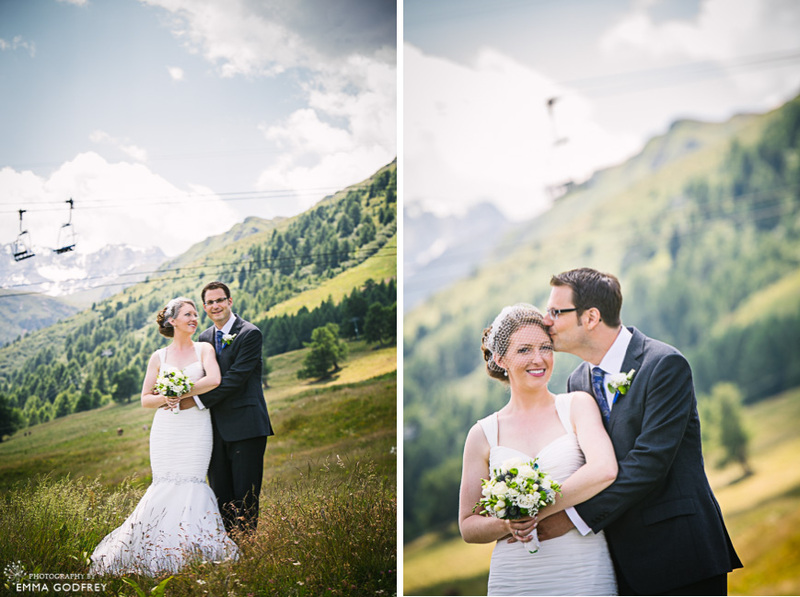 A great deal of preparation went into Andrea and Fabian’a outdoor mountain wedding in Thyon. A year before, they visited the region and scouted places where they could bring an international group of friends and family to enjoy a celebration in the mountains. They wanted to keep everything in one place so that time wasn’t wasted moving from place to place. In the end the lovely La Cambuse in Thyon-les-Collons, won their hearts. It was at the same time that I first met them and took their engagement photos up in Villars-sur-Ollon. Andrea’s family had travelled from Canada and were staying for a little while to explore the area. They had rented a big chalet in Thyon for the whole family and it made a wonderful backdrop for Andrea’s bridal details and preparations. 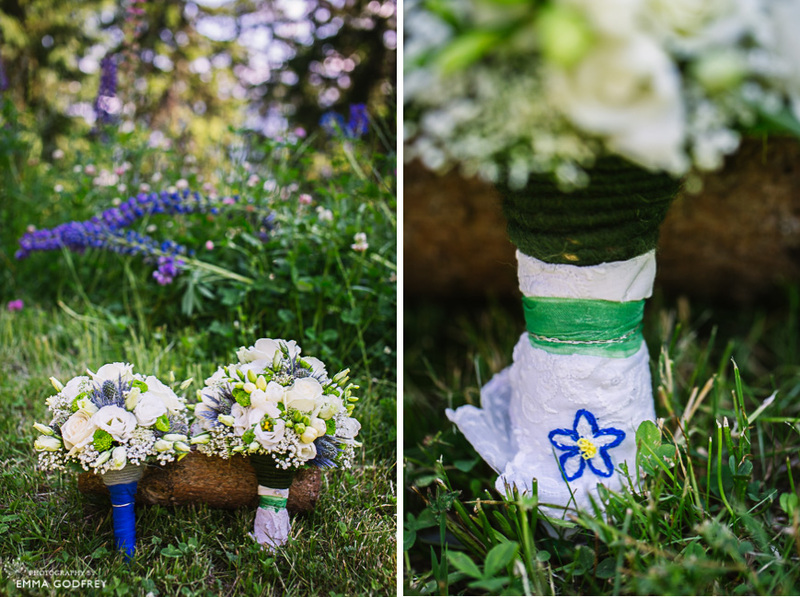 The wooden beams and lupin-filled gardens were perfectly in theme and reflected the couple’s vision for their day. We used a room at the top of the house for Andrea’s getting ready pictures, quietly away from where the rest of the family were getting ready, she and bridesmaid Amélie could enjoy getting dressed and a few girly moments together. The couple really wanted to make the most of their outdoor mountain wedding day and had planned plenty of time for all the photos that they wanted. For their first look we had over an hour to ourselves, which meant that getting the shots they had dreamed of was a wonderfully calm and fun experience for everyone. We walked Fabian out along the road and with bestman Vincent and bridesmaid Amélie helping, managed to keep him laughing while Andrea joined us, the tension building as she made her way up to him and tapped on her shoulder. Andrea had really thought about the memories she wanted from their day and one of her instructions to me was that she wanted Fabian’s reactions: that moment when he saw her in her dress for the first time was something she wanted immortalised. Especially as she had chosen a dress he would never have guessed at - and doesn’t it look fabulous on her! Family photographs were also incredibly important to the couple and we had discussed how to make sure we could get all the combinations that they wanted in the time frame. We decided to do all the close family groupings before the ceremony, with a “mum” first look at the chalet for Andrea’s mother. The chalet garden gave us a wonderful backlit spot to get some shots of everyone, with the house just a few meters away it was easy for water breaks and allowed the whole family to mill around at ease. Can you imagine a better backdrop for two travel lovers to say their vows in front of? At just the right time in the early evening, we had such a perfect view for their outdoor wedding ceremony. There were lots of special touches to the couple’s exchange of vows ceremony. Married officially a couple of days before, Andrea’s brother officiated and many family members read poems and passages. The rings were passed around the guests for them to bless and bestow their wishes upon the happy couple. As the sun began to set, the team at La Cambuse, brought out some typically Swiss apéro nibbles and the bar opened for cocktails to the sound of the Alpen horns. Andrea and Fabian had provided lots of board and card games for their guests to enjoy throughout the afternoon and it was great to see everyone relaxing in the sunshine. Wild flowers were on Andrea’s photo wish list for her engagement photos and we found fields of spring flowers up in Villars the previous May. You can imagine how happy both of us were to see the glades of deep blue and purple lupins that we found up in Thyon the day of her wedding. As well as being extremely beautiful, they matched her colour scheme perfectly. La Cambuse is one of those restaurants which have managed to achieve a modern take on traditional chalet style and it looked wonderful. The flowers worked perfectly in the setting, bringing colour and nature to the tables without overpowering them. Andrea and Fabian love board games and had used elements of these in their decor. With Uno cards for table numbers, quiz questions for getting to know your neighbours and a personalised pack of cards for their wedding favours, with one of their engagement photos on the back! Dinner was delicious and interspersed with speeches, games and kind words. It was lovely to see the two families come together on the dance floor, everyone obviously enjoying the Canadian/French music and each other’s company. I left them to some signature Canadian cocktails and dancing well into the night.